For 7 weeks over the summer, I battled constant pain in my chest. I was in a constant state of panic and fear. The feeling was most definitely physical. It hurt. It was distracting and most definitely debilitating. I’m not a big fan of taking medication, but after fighting to heal myself all summer, I finally accepted that I needed more help. The first week was a long slog. The medication made me dizzy and exhausted. I still had chest pain but was hopeful that it may still improve. I took the quick release medication that gave me a short time of lessened pain followed by a great expanse of worse pain. After a week, this levelled out a bit and I felt less frantic. The pain was constant but more of a hum that a fog horn. I was heading in the right direction. After a fortnight, the gp increased my dose. I’m glad I waited to take the higher dose as it had taken a while to adjust when I first took it. The higher dose brought back to fatigue and heavy limbs, but also brought on another symptom: excessive sweating. I’m talking sweat raining off my face. Attractive. But, and this is a biggie, I started to feel more calm. If I hadn’t felt better, I wouldn’t have continued because between the head fog and full on sweats it was a tough drug to take. After 4 weeks, I returned to the GP for a checkup. My GP is wonderful and I cannot sing his praises highly enough. He makes sure he sees me regularly to check up on me for which I am very grateful. We discussed the sweating which he was surprised by (I’ve learned this is one of the more uncommon side effects which really shouldn’t surprise me given my medical history). 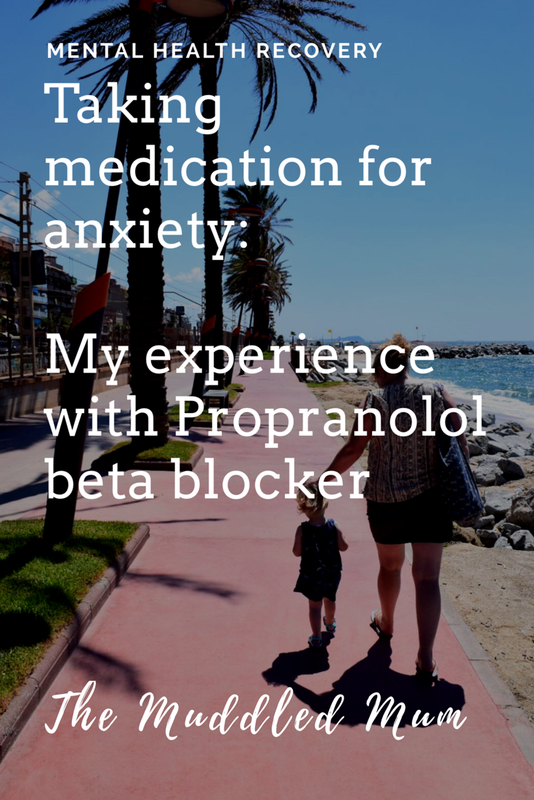 I decided I wanted to continue with propranolol as my racing heart and chest pain had significantly reduced most of the time. However, I was struggling to take it 3 times a day so we decided to switch to a higher dose on slow release. The improvement after this switch happened after a couple of days: I am calm. I am not preoccupied thinking about the fear gripping my chest. I feel level and at times, I even feel relaxed. The slow release seems to keep me on an even keel all day and it is great to finally feel some relief from the anxiety. Being stuck in a state of panic is excruciating. At times, I still feel very panicked and the pain returns – particularly if something triggers my PTSD – but this medication means that I am able to transistion out of the physical state once I have processed the situation and mentally calmed down. Now that I’ve felt this way for a week, I’ve started to think about the sweating. I love the feeling of calm, but the sweating is really really unpleasant. I think my next move will now be trying out other beta blockers to see if I can find one that keeps me calm but doesn’t make me look like I’ve just stepped out of the sauna.